Do you spend too much time and energy trying to reach key decision makers? Do you ever wish you could find the right person to make an introduction to that decision maker? Then, it’s time you investigate the solution of social selling. CSO Insights analyzed the relevance of social media to salespeople’s ability to identify decision makers and create new opportunities. Data captured in the 2016 CSO Insights Sales Best Practice Study show that world-class sales performers rank two years ahead of average sales performers in results. CSO Insights, a division of The Miller Heiman Group, discovered that focus, speed, integration, and adoption make up the critical success factors needed to leverage social media effectively across organizations. CSO Insights only began to examine behaviors around social selling in 2015, yet its work has already proven to be highly relevant. As the chart above illustrates, the difference in responses from world-class sale performers is significant: From 48 percent in 2015 up to 71 percent in 2016. This finding supports two critical success factors that go with all things social: focus and speed. World-class sales performers understand they must focus on social the right way and need to move with speed to drive this change. In parallel, the response from “All Respondents” segment remained stable, but on a low level: 19 percent in 2015 and 20 percent in 2016. Further, the study emphasizes that implementing social media guidelines is one of the prime building blocks of a solid social selling or social engagement foundation. Social engagement covers the entire customer’s journey. You must equip your salespeople with skills, tools, and content to successfully navigate the dynamics of change, decision, and value along the customer’s journey by leveraging social media. This process requires an integrated social strategy that involves social training sessions and content services, as well as coaching on the required skills and behaviors. I use Twitter, Facebook, and LinkedIn. On Twitter, I began with a few dozen followers; today it’s up to 4,000 in only six months. I find LinkedIn the most effective in reaching key decision makers. So I will focus on this one social channel for this post. Before you attempt social selling, build a professional, client-focused profile on LinkedIn. I cannot stress the importance of this step enough. When you make contact with anyone, the first thing he or she will do is Google your name. If you have a complete profile, it will show up at the top of the page. It is the first impression one sees. Before you reach out to connect with a key decision maker, connect with several other employees in same company, especially if they occupy the same department or you have a strong connection to them. This effort pays off when people see your connections; their willingness to accept your connect request rises. This approach works well for me. Before I contact a company, I always put the company name through the advanced search function. It amazes me how often I’m already connected to someone who knows the person I need to meet. LinkedIn is the most powerful business network in the world at nearly 500 million members. You are bound to find the right person you need to know. LinkedIn groups offer another excellent way to access your prospects. There are nearly two million groups aligned around a limitless list of interests. 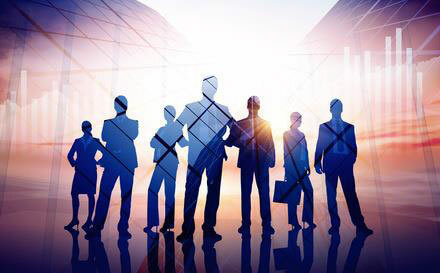 Here, you can further establish your expertise by participating in group discussions with like-minded people. These affinity groups are ideal for messaging a prospect even before you are connected. I turn to the groups also to find other potential prospects. To begin, visit the profile of your prospect and check out to which groups he belongs. Join one or more of the groups. I post blogs, white papers and participate in several discussion groups. Thirty percent of my website traffic comes from discussion groups. Here you can be perceived as an expert and use the directory to reach key decision makers who’ve read some of your content. Remember, a relationship on LinkedIn is similar to a direct business relationship. Rather than use the LinkedIn introduction, I search for the person’s direct e-mail and, if I can, approach the person directly. Personalize your message, keep it short and to the point. If I a contact of mine is two to three degrees from a person I am trying to meet, I will reach out. Sometimes, this approach can yield a better outcome than an unexpected phone call asking for help. Do post on LinkedIn Publisher as it is a superb way to offer your prospects added value by helping them overcome a problem or solve a pain point. This action can advance your efforts to establish credibility as an expert, as well as build reciprocity with your readers. 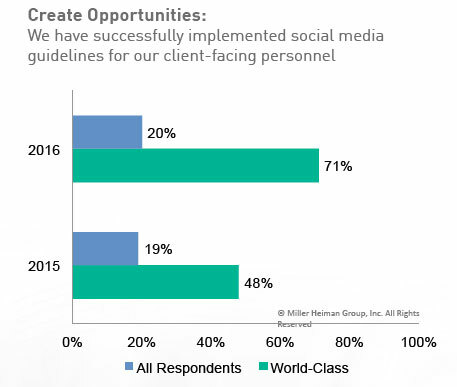 Look at this data from the Miller Heiman Group. 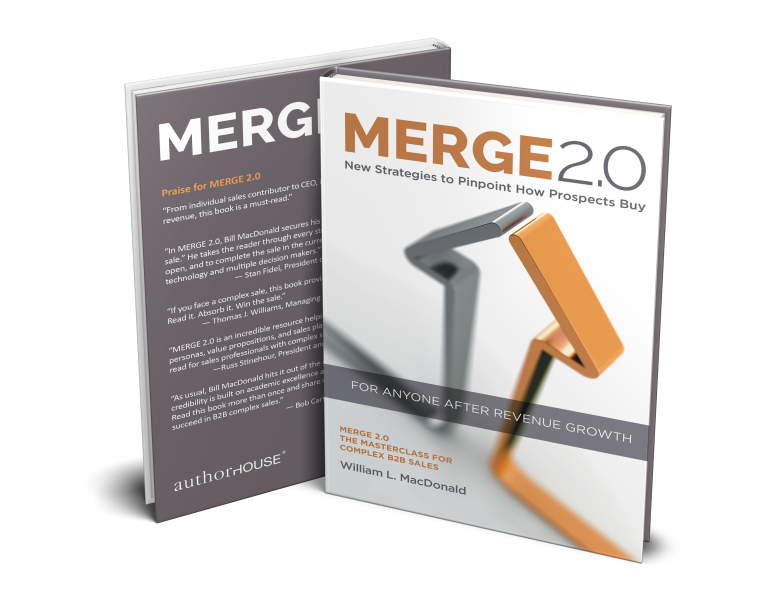 It shows how much more your sales force can achieve when marketing and sales are aligned and working together on a social selling strategy. 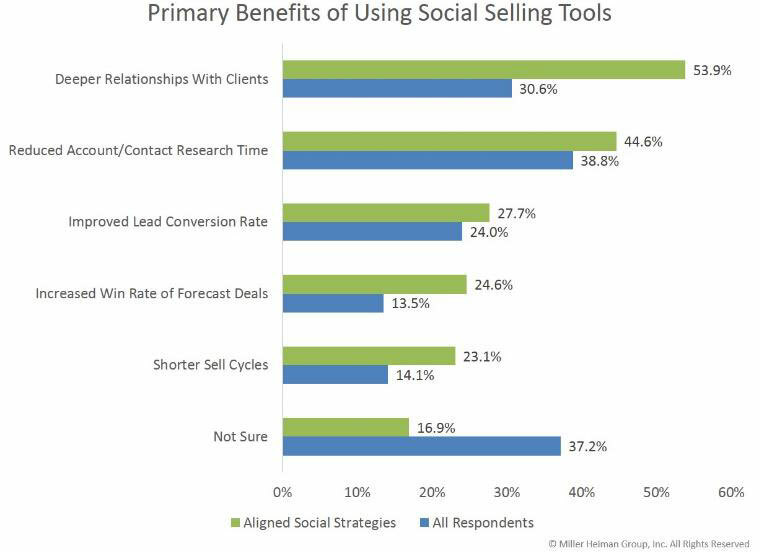 The key to social selling? Be social and don’t sell. Be helpful and don’t preach. Instead, work to persuade your audience with sound evidence and an authentic emotional pull on their pain. Convince, then convert. I know this thinking may seem counterintuitive. Social selling is not selling. In today’s digital world, everything we do, certainly from the top of the funnel through the middle of the funnel, should be education, information, inspiration. For those of you who love to sell, a little soft selling is okay. I know you have heard this hundreds of times before, but it bears repeating. Hasta la vista are the days of simply handling objections, memorizing closing techniques, and asking for the order. Oh, you may still need to ask for the order on occasion. However, nowadays, if you’re doing everything right, your prospect is as likely to hand you the order without you asking.